Buying a dining room table can feel like a big commitment, and for good reason: they're generally large and expensive! And since a well-made dining table should last many years (or even decades), you might be concerned about its ability to accommodate your ever-evolving style. 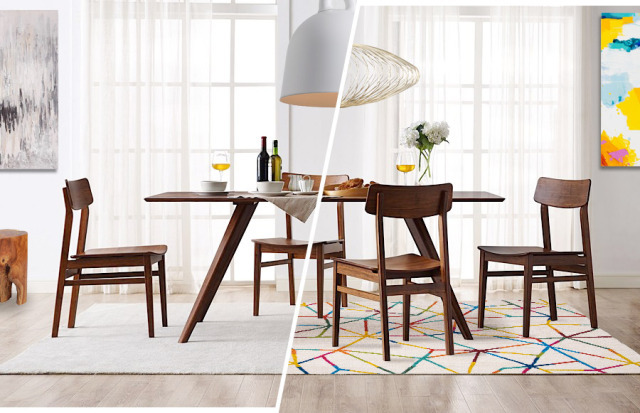 These four dining rooms prove that if you pick a table you loveespecially one with gorgeous linesit will shine in almost any aesthetic. 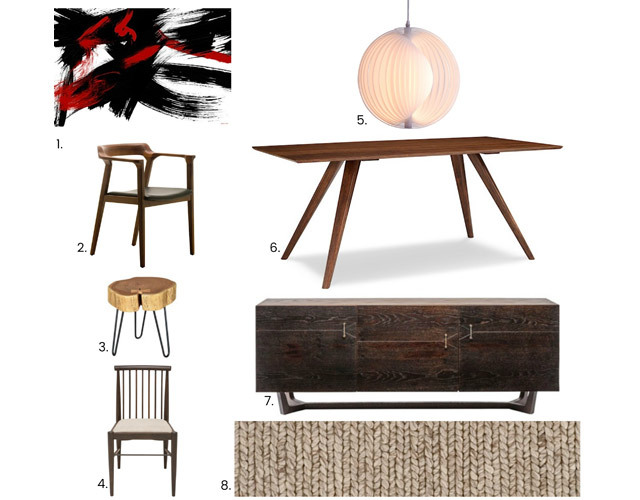 Check out how our solid bamboo Zenith Dining Table easily adapts to four very different styles. 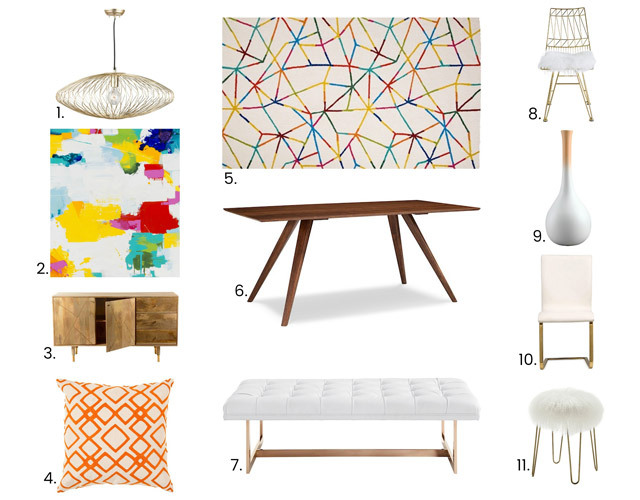 Pro-tip: in all of these rooms, mix-&-match seating keeps the look from being too matchy-matchy and allows you to gradually swap in new pieces when you're craving a fresh look. The clean lines of the Zenith Table provide the perfect foundation for a dining room done up in the always on-trend Scandi style. The textiles and pendant keep things light, the chairs and artwork provide a contrasting bit of black, the rug and cushions provide covetable coziness, and the mirror reflects all available light. Our Alban Dining Chair is a modern take on the classic Danish designs of Hans Wegner, while the Petro Stool adds the necessary raw wood and provides extra seating. For the true Scandinavian experience, use the Laurel Sideboard as a barfully stocked with aquavit, of course. Just because you're fancy doesn't mean you're not also fun! The beautiful simplicity of the Zenith Table grounds the more playful elements of this room, with the gorgeous wood Messinki Sideboard and the ceramic Tappo Vase also providing warmth. The bold art and festive rug have a ton of colors you could play with, but we chose to pull out the orange via the pillow and vase which, when paired with gold, creates one of those color combinations that doesn't seem like it should work but, oh, how it does. 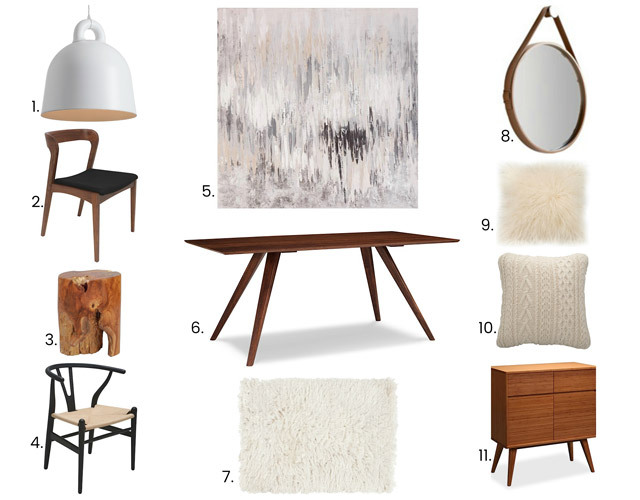 For an added level of luxe, add the delightfully fluffy and fun Allure Dining Chair and Zelda Bench, though you might love the floof so much that you're tempted to go all out and get the Whisper 1005 Rug and Lamb Fur Pillow, too. Gold details tie the room together and provide plenty of glitz, but because they're just details, you'll avoid the dreaded Caesars Palace look. If you love the furniture design of Naoto Fukasawa and George Nakashima, the art of Kazuo Shiraga, and the lighting style of Isamu Noguchi (with a bit of Japanese-inspired George Nelson thrown in for good measure), this is the dining room for you. The Zenith Table is crafted out of solid bambooa material often used in Japanese design while the Adele Side Table and Siku Buffet are adorned with the fascinating beautiful-yet-practical butterfly joints. Finish off the room with the Comfort Rug, which evokes tatami rice mats but is woven of cozier wool. 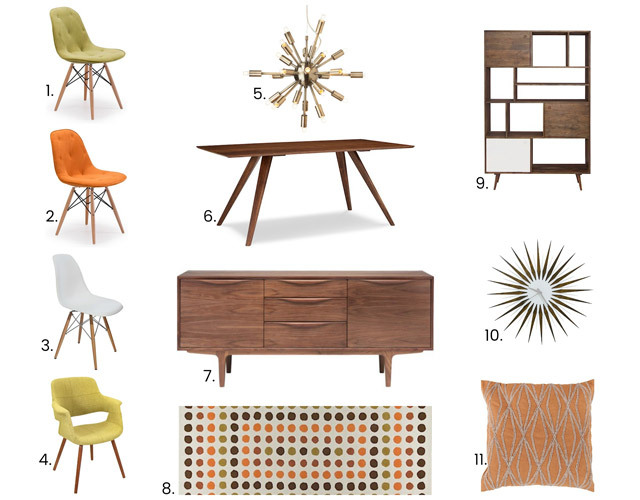 The Zenith table was absolutely made for a Mid-Century Modern dining room. Its sharp angles work perfectly with the futuristic lines of a Sputnik chandelier and a starburst clock, while the chairs and the bookcase share similarly flared legs. Meanwhile, the pop geometry of the Huxley Rug and Beaumont Pillow bring plenty of fun to a room full of highly esteemed, sure-to-be-heirloom furniture pieces. We went for a classic earth tones palette, but almost everything shown here is also available in cool tones if you prefer blue, green, purple, grey, and silver.